Like Jesus, we are to be witnesses of obedience. According to Vatican Radio, Pope Francis urged this today, April 27, 2017, during his daily morning Mass at Casa Santa Marta, his last before departing for his Apostolic Visit to Egypt, April 28-29. 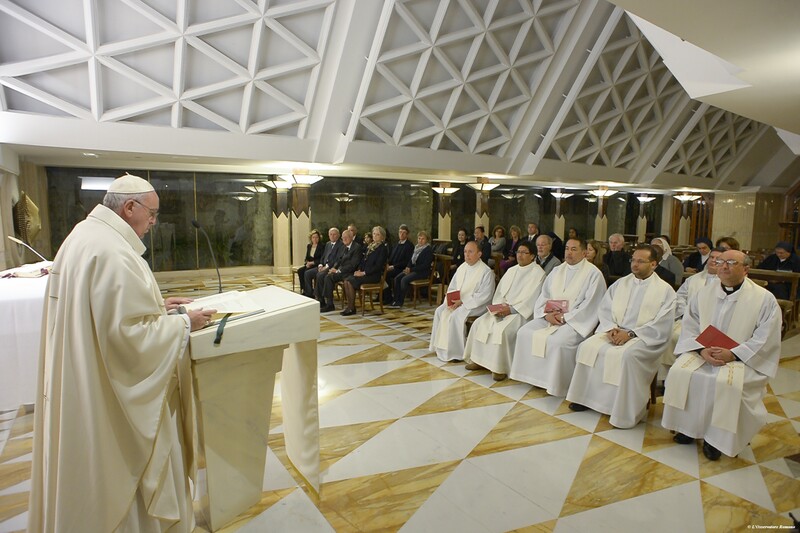 The Pope’s homily focused on today’s reading, in which Peter says before the Sanhedrin: “You must obey God rather than men.” Francis recalled that an angel had freed Peter and the Apostles from prison and that they were forbidden to teach in Jesus’s name. Yet the high priest said: “You have filled Jerusalem with your teaching and want to bring this man’s blood upon us”. To help those present in his chapel better understand this event, the Jesuit Pontiff also referred to the Book of Acts, regarding the early months of the Church which describes a growing Christian community and many miracles. While there was the faith of the people, Francis said, there were also “wily” people trying to take advantage of the situation and “wanting to make a career for themselves,” he lamented. He stressed that being Christian demands this trait. “Jesus,” the Pope clarified, “is not the testimonial of an idea, of a philosophy, of a company, of a bank or of power: he is a testimonial of obedience”. To become a “witness of obedience,” the Pontiff highlighted, we need the “grace of the Holy Spirit”. To be witnesses of obedience, Francis also warned, implies consequences. In the first reading, after Peter responded, the high priests wanted to put him to death. “Persecutions were the consequences of this witness of obedience. When Jesus lists the Beatitudes he ends with the words ‘Blessed are you when they insult you and persecute you,’” he said. The cross, the Pope pointed out, cannot be taken away from the life of a Christian. Pope Francis concluded his homily saying that in order to be witnesses of obedience like Jesus, it is necessary to pray, to recognize that we are sinners with much “worldliness” in our hearts.